First Man is a 2018 History Drama movie directed by . It stars Ryan Gosling, Claire Foy, Jason Clarke, among others. 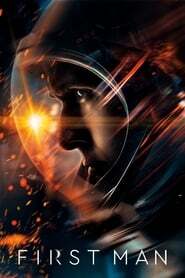 First Man is currently rated 7.1 stars on the ReelBugs scale. "One giant leap into the unknown"
Spoiler Alert: He lands on the moon. Matt Damon is waiting for him on the moon with a baked potato. i came for the comment section instead of the trailer. In Damien Chazelle We Trust. When Will This Garbage Stop....Was In Middle Of An Awesome Trailer For An Awesome Time In American History With Awesome Bravery By , Let's Admit It , Brave Men, And Some Mental Midget Had To Insert A Woman Calling Men BOYS To Get Their Pound Of Politically Correct Flesh. You Reap What You Sew...People...Just Wait. Taking PC to where no PC has gone before! At least when we finally have to go to war with the flat-earthers we can be confident that any long-range missiles or artillery they fire at us will be wildly off-target. Looks interesting. I can't in good faith support the movie because of how they omitted the American flag, so I definitely won't be catching it in theaters. Scared panicking woman says, "You are a bunch of boys. You don't have anything under control." I say, "We have our fear and emotions under control." This looks like Gravity, Interstellar and The Martian! Wow, a reboot of the Stanley Kubrick's classic. Why were they in Gemini suits entering the Gemini capsule and then it shows a Saturn V Ignition? I wonder if Man Damon will be on the moon waiting in a surprise cameo. I am amazed why they make a movie on moon landing in 2018. Buzz Aldrin: "Couldn't they call it 'First Men'"? Flat earthers be like "Based on the Novel by the US government"
One day when humans are flying in ships like the Prometheus. They'll wonder how the hell 20th Century man ever managed to get into Space in a load of old crap. I, for one, am incredibly glad that they're including his story leading up to the moon walk and Neil's life as a test pilot before. The X-15 is one of my favorite aircraft and is a crucial event that prepared Neil for spaceflight. Spoiler alert: Matt Damon screws up the mission.